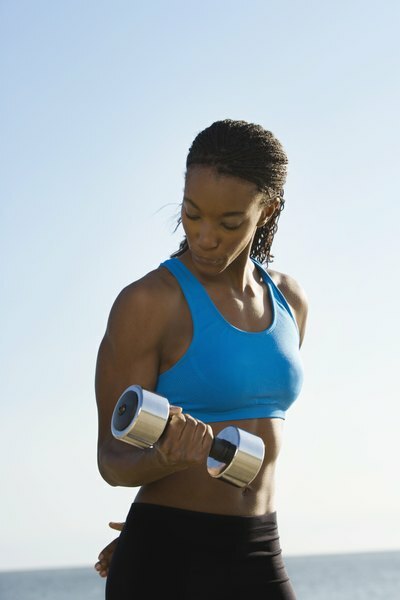 Develop tone in your biceps with a high volume workout. You’ll be happy to shed your shirt sleeves after you’ve followed an extreme biceps workout program and have developed significant tone in your arms. The biceps at the front of your upper arms are often the focus of those looking for the biggest aesthetic impact from their workouts. An extreme bicep workout routine is one that features an array of exercises with multiple sets at a relatively higher number of repetitions. Your biceps bend, or flex, your elbow joints and you can effectively isolate them during your workouts. But when you’re scheduling your extreme bicep workouts, keep in mind that the bicep is a smaller muscle that is also involved in more complex movements. The bicep is recruited during many back exercises that involve pulling, such as lat pulldown, pull-ups and seated row. Your biceps need to have at least 72 hours of rest in between extreme workouts, so schedule them around your back workout accordingly. To give your biceps enough rest, the most you should do the routine is twice per week with two days of rest in between. A Monday and Thursday schedule would be appropriate. Begin your workout with twenty-ones, which are a way to immediately attack the biceps by using a weighted barbell. Stand with your feet set to shoulder-width apart and hold the barbell down in front of your thighs with your hands shoulder-width and your palms facing forwards. Bend your elbows to bring the barbell to where your elbows are bent to 90 degrees -- and then return back to your thighs. Do seven repetitions. Next, start the barbell raised with your elbows bent to 90 degrees and curl the bar up towards your shoulders, and then lower the bar until your elbows are at 90 degrees again. Perform seven repetitions. Lastly, perform the exercise at a full range of motion so that the barbell begins at the front of your thighs and ends at your shoulders. You’ll do seven repetitions of these, which will mean you’ll complete a total of 21 repetitions. Dumbbell curls are also completed while standing. Hold each dumbbell down by your sides with your palms facing forward. Bend your elbows to curl the weights up to your shoulders and then lower the weights back down. Complete two to three sets of 10 to 12 repetitions of these, resting just one to two minutes in between each set. Move right into hammer curls, which are similar to regular curls except that instead of your palms facing forward, they face inwards towards each other. Complete two to three sets of 10 to 12 repetitions of hammer curls. To finish up your workout, do an activity referred to as “moving down the rack.” Start with the heaviest dumbbells that allow you to perform just three repetitions of dumbbell curl. Perform the three repetitions. Immediately move down the rack and pick the next lower weight and perform five repetitions. Drop the weights and move onto the next lower weight, where you’ll perform seven repetitions. Continue in this manner of moving down the rack until you complete 10 repetitions, then 15 repetitions and then 20 repetitions. 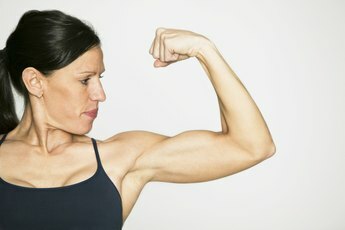 Bodybuilding.com: What Is The Best Bicep Workout Known For Building Massive Guns?